Lesley Ma is curator of ink art at M+, Hong Kong and managing editor of Para Site Books. She had held positions at the Asia Art Archive in Hong Kong and MOCA, Los Angeles and was a project director at Cai Studio in New York. She is cocurrently a doctoral candidate in Art History, Theory, and Criticism at the University of California, San Diego. Yehuda E. Safran studied art at Saint Martin’s School of Art, London, architecture at The Royal College of Art, London, and philosophy at University College, London. He has taught at the Architectural Association, Goldsmith’s College, University of London, The Royal College of Art, London, and the Jan van Eyck Academy, Maastricht. He was a Fellow of the Chicago Institute of Architecture and Urbanism and Visiting Professor at the School of Architecture, University of Illinois, as well as at Rhode Island School of Design and Harvard Graduate School of Design. He has published in 9H, Casabella, Domus, Sight and Sound, Paris Match, Lotus, A+U, AA Files, Prototypo, Metalocus, Abitare, The Plan, artpress, and others. With Steven Holl and others, he was editor of 32 Beijing / New York, and among the editors of springerin, Vienna. He is the author of Mies van der Rohe (2000). He curated the Frederick Kiesler show at the Architectural Association (1989) and the Arts Council of Great Britain touring exhibition and published The Architecture of Adolf Loos (1985), among others. He was a trustee of the 9h gallery, a founding member of the Architecture Foundation, London, and a member of the International College of Philosophy, Paris. Currently he lives and works in New York, where he directs the Potlatch journal and the Research Lab for Art and Architecture, and teaches at Columbia University Graduate School of Architecture, Planning, and Preservation. In addition, he is a consultant to Steven Holl Architects. 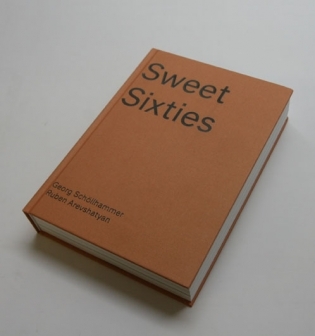 The book has been published as part of the Sweet Sixties project, 2010–13. Sweet Sixties is a long-term trans-regional research initiative working between art, research, media, and educational contexts in Europe, the Middle East, western and central Asia, Latin America, and northern Africa. Involving a particular group of experimentally oriented arts and research groups as well as individual artists, researchers, and media, Sweet Sixties investigates hidden histories or underexposed cultural junctions and exchange channels in the revolutionary period of the 1960s.